Yu-Gi-Oh! 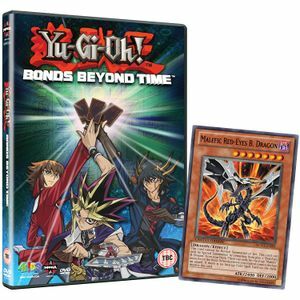 3D Bonds Beyond Time, known in Japan as Yu-Gi-Oh! The Movie: Super Fusion! 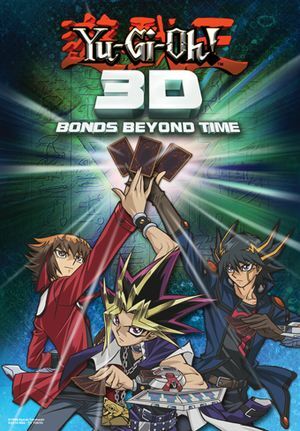 Bonds That Transcend Time is a 3D film, starring the three protagonists of Yu-Gi-Oh!, Yu-Gi-Oh! GX and Yu-Gi-Oh! 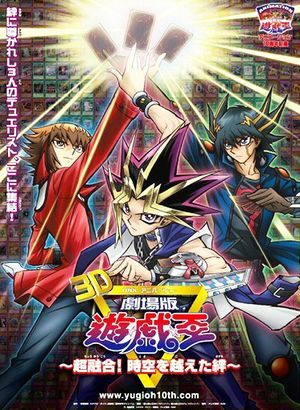 5D's: Yugi Muto, Jaden Yuki, and Yusei Fudo. The movie was produced in celebration of the tenth anniversary of the series. Unlike the previous movie, this movie is canon to the anime series, taking place before the events of the Crash Town arc in Yu-Gi-Oh! 5D's, as well as Paradox being revealed to have been sent by Z-one. The movie is also shown to take place after episode 80 of 5D's, as Bruno (whom Yusei did not meet until 80) was shown as one of the people Yusei was thinking about near the end of the Duel with Paradox. In the future, human civilization had been destroyed. One of the few survivors, Paradox, travels back in time to prevent the destruction of his timeline from occurring by eliminating the source of that destruction; Duel Monsters and its creator, Maximillion Pegasus. Yusei Fudo has a nightmare about the Zero Reverse incident that his father created. With Yusei upset, Jack Atlas and Crow Hogan decide to have a Turbo Duel to cheer Yusei up. After driving down the highway, Paradox, who traveled back to Yusei's timeline, challenges Yusei to a Turbo Duel. After a few turns, Yusei tunes "Junk Synchro" with "Junk Warrior" and Synchro Summons "Stardust Dragon", but Paradox reveals a blank card and launches a beam at "Stardust Dragon", absorbing it into the blank card and creating a blackened, corrupted version of it. Yusei confronts Paradox, who shows him the corrupt card, before vanishing through time again. Yusei, Jack and Crow halt their Duel Runners and look in bewilderment at the original "Stardust Dragon" card, whose illustration has just been blanked. Yusei, Jack and Crow then start questioning Paradox's identity at their garage, when Akiza Izinski, Leo and Luna arrive and show the archives they found about the past. They found an old article about Maximillion Pegasus and Yugi Muto, with Yusei recognizing Yugi as a legendary duelist. Even Jack admits Yugi is a legend, despite his goofy haircut. However, the trip then reveals an article about "Stardust Dragon" assaulting various duelists in Europe. Knowing that "Stardust Dragon" could not have existed in that era, Yusei zooms in on the article's picture to discover Paradox standing in the background of the dragons. Suddenly, the sky darkens and New Domino City begins to crumble and collapse. Their signer marks begin to Glow. Having watched one-too-many movies, Jack deduces that if something is changed in the past, the future is supposed to change. Yusei then remembers that Paradox gloated about how their era and time would soon be coming to an end. The Signers marks begin to glow as the complete Crimson Dragon appears on Yusei's back. Yusei's Duel Runner begins to glow with the Crimson Dragon's power. He decides to ride, telling the dragon that he'll go wherever he takes him so long as it gives him a chance to stop Paradox. The consequences of Paradox's actions. In Venice, Paradox finds Jaden Yuki, who still has the powers of Yubel and The Supreme King. 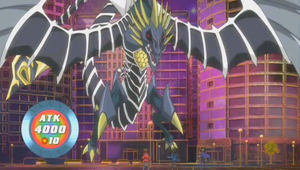 Paradox attacks him with "Cyber End Dragon" and "Rainbow Dragon". Jaden manages to resist by Summoning "Elemental HERO Neos" to protect him. In response, Paradox Summons "Stardust Dragon", a monster from the future, and proceeds to overwhelm Jaden (This scene is how the movie opens before changing to Yusei's nightmare of Zero Reverse). Stardust Dragon's first attack almost destroys Neos and sends the two skidding backwards into a wall. As Paradox commands Stardust Dragon to attack Jaden again, Yusei appears with the Crimson Dragon, who takes the blows for Jaden. Paradox disappears once again. Soon, Yusei and Jaden began to chat on a roof. Seeing Yusei's Duel Runner, Jaden gets excited seeing such technology, asking Yusei if that is his 'Bike' (Duel Runner) of the future. He then explains that he came here because he heard that there were cards missing from his classmates. Yusei explains to Jaden that Paradox is trying to change the past. Jaden then uses his laptop to find an article about the event that Paradox caused that would create a major historical event. (In the English version, Jaden did not believe Yusei, which is why he opened his laptop and discovered that truth.) Jaden then checks his card, as his "Elemental HERO Neos" card turns into a blank card. As the country began to collapse, Yusei tells Jaden that they must hurry to save the world. Yusei and Jaden then ride Yusei's Duel Runner, with the Crimson Dragon taking both of them even further back in time. Meanwhile, in Yugi's timeline, sometime after Battle City but before the Waking the Dragons arc, Maximillion Pegasus is currently holding a tournament. The Sakiyomi Jan Bang! makes a cameo as the MC of the event. Yugi and his grandfather, Solomon Muto, notices "Stardust Dragon", "Cyber End Dragon" and "Rainbow Dragon" in the sky. 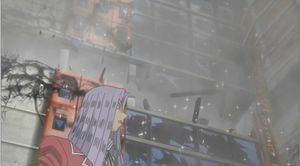 Paradox then attacks the crowd with "Cyber End Dragon" and "Stardust Dragon", killing almost everyone, including Pegasus and Yugi's grandfather. Amongst the ruins, Yugi is the only survivor against Paradox's attack. He stands up and searches for other survivors. He finds a bandanna belonging to his grandfather and cries over his death. He then sees Paradox laughing on top of a building, happy that he finally completed his mission. At that moment a crack in the space appears and the Crimson Dragon suddenly "swallows" Yugi. Then, Yugi is thrown back in time at the same place half an hour earlier. Yusei and Jaden find Yugi and explain to him what they know about Paradox. Yugi agrees to fight with them against Paradox to free the trapped monsters and save the world. At the event, Jaden Summons Yubel and starts to scare the audience so they would flee. By doing so, Yugi hopes the future is safe as Jaden regains his "Elemental HERO Neos" card. However, Paradox arrives regardless, to the shock of the heroes. After Paradox takes his mask off and introduces himself, Yugi asks Paradox what kind of person he is. Paradox replies that he is from a future which was destroyed by Duel Monsters. He intends to destroy the game of Duel Monsters to prevent that future from happening. Yusei tries to tell Paradox that by changing time and trying to destroy Duel Monsters, he will also erase people from the timeline as well, to which Paradox replies that such sacrifices are insignificant in his grand experiment. Yusei, Yugi and Jaden challenge Paradox to a 3 on 1 Duel, with a time limit of 20 minutes, before Pegasus arrives at the event and the other dimensions crumble to pieces. Paradox's Duel Runner transforms into flight mode and he floats up high. 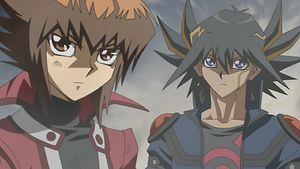 Jaden's eyes change color as Yubel appears behind him. Yusei's Mark of the Dragon glows as the Crimson Dragon roars behind him. The two Duel Kings say their catchphrases and then Yami says to Yugi that the Duel against Paradox would be the toughest and Yugi responds by saying that they should rise to the challenge. Yugi transforms into Yami and says his catchphrase. The three activate their Duel Disks and the Duel begins. On a building overlooking the duel, Banner tells Pharaoh to wish the three luck. Yugi, Yusei and Jaden stand up to Paradox. 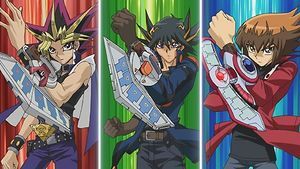 Yugi, Yusei and Jaden activate their Duel Disks. Paradox declares the first move. He activates "Malefic World" that lets him put a random "Malefic" monster from his Deck to his hand instead of drawing a card during his Draw Phase. The field begins transforming into a purple atmosphere full of stars. Then, he sends "Cyber End Dragon" from his Extra Deck to the Graveyard to Special Summon "Malefic Cyber End Dragon" from his hand. He sets a card to end his turn. By this time, Yugi, Jaden and Yusei come to the realization why Paradox has been stealing monsters: he's using them to Summon the "Malefic" monsters, as Yugi understands that by destroying a monster's good version, Paradox can Summon their dark version. Yusei tells everybody that despite them never fighting together before, they must work together to defeat Paradox, as Yugi & Jaden agree. Yugi then asks Yusei to take the first turn for his team. Yusei activates "Reincarnation of Hope", which sends "Sonic Chick" and "Quillbolt Hedgehog" from his hand to the Graveyard; but on their team's second Standby Phase, they are allowed to add a monster from their Deck to their hand. Yusei then Summons "Junk Synchron" and due to its effect, he also Summons "Sonic Chick" back on his field. He then activates the effect of "Quillbolt Hedgehog" to Summon it back to his field. He then uses the 3 monsters to Synchro Summon "Junk Gardna" in Defense Position. Yugi becomes surprised by the concept of Synchro Summoning, as Jaden is just as confused by Yusei's Synchro card, but praises Yusei's play and shows his interest in the future cards. Yusei Sets 2 cards to end his turn. Paradox adds "Malefic Rainbow Dragon" to his hand due to the effect of "Malefic World". He then sends "Rainbow Dragon" from his Deck to the Graveyard to Special Summon "Malefic Rainbow Dragon" from his hand. Jaden then becomes angry since Paradox is using Jesse's card. Paradox attacks "Junk Gardna" with "Malefic Rainbow Dragon", but Yusei activates the effect of "Junk Gardna" that switches "Malefic Rainbow Dragon" to Defense Position, thus stopping the attack. Paradox then attacks "Junk Gardna" with "Malefic Cyber End Dragon", this time destroying it and inflicting Piercing Damage to Yusei's LP. Yusei felt the real damage that Paradox did to him, but not before activating "Junk Gardna's" second ability, which switches "Malefic Cyber End Dragon" to Defense Position and "Miracle's Wake", reviving his "Junk Gardna". Yusei apologizes for losing some LP, but Yami and Jaden insisted that Yusei did a good job, stopping the assault of both monsters. Paradox then Sets a card and ends his turn. As Jaden's turn begins, he asks Yusei if he may borrow "Junk Gardna". Yusei agrees, as Jaden activates "Polymerization", fusing his "Elemental HERO Neos" with Yusei's "Junk Gardna" to Fusion Summon "Elemental HERO Neos Knight". The ATK of "Elemental HERO Neos Knight" increases by half the ATK of "Junk Gardna", making it 3200. Because of the other effect of "Elemental HERO Neos Knight", it can attack twice during the same Battle Phase. Thus, Jaden attacks Paradox's "Malefic Rainbow Dragon" and "Malefic Cyber End Dragon" with "Elemental HERO Neos Knight". Paradox activates "Malefic Tune", allowing him to draw 2 cards. Jaden Sets four cards to end his turn. Paradox adds "Malefic Stardust Dragon" to his hand due to the effect of "Malefic World". He then sends "Stardust Dragon" from his Extra Deck to the Graveyard to Special Summon "Malefic Stardust Dragon". Yusei then became shocked to see that his ace monster became corrupted. Paradox then Normal Summons "Malefic Parallel Gear" and tunes it with "Malefic Stardust Dragon" to Synchro Summon "Malefic Paradox Dragon". Yusei is stunned by this, to which Paradox says that he is not the only one who could Synchro Summon. He activates its effect, Special Summoning "Stardust Dragon" and decreasing the ATK of Jaden's "Elemental HERO Neos Knight" by 2500. Paradox attacks "Elemental HERO Neos Knight" with "Malefic Paradox Dragon", but Jaden activates "Hero Barrier", negating the attack. Yugi and Yusei praise Jaden for that move, but Paradox activates "Malefic Claw Stream", destroying "Elemental HERO Neos Knight", but Jaden activates "Elemental Mirage", resurrecting "Elemental HERO Neos Knight" with its original ATK (2500). He explains to Yugi and Yusei that he did this to ensure that there was at least a monster on the field by Yugi's turn. Because of the effect of "Malefic Paradox Dragon", the ATK of "Elemental HERO Neos Knight" is reduced to 0. Paradox Sets 2 cards to end his turn. As Yugi's turn begins, he adds "Dark Magician" to his hand due to Yusei's "Reincarnation of Hope". Paradox knew that he would try to go for "Dark Magician". Yugi activates "Ancient Rules", which allows him to Special Summon it. Dark Magician, however, is still affected by the effect of Malefic Paradox Dragon, reducing its ATK to zero. Jaden gets excited seeing Yugi's ace card, while Yusei remembers that based on the archives, Dark Magician is Yugi's ace monster. At this point, Yusei asks Yami to destroy "Stardust Dragon", since "Malefic Paradox Dragon's" effect will prevent them from launching an attack. Yugi then activates "Bond Between Teacher and Student", which Summons "Dark Magician Girl" to his field. Yami then activates "Magic Gate of Miracles", which lets him take control of one of Paradox's monsters. Paradox assumes Yugi is going after his "Malefic Paradox Dragon", so in response, Paradox chains "Malefic Force", which protects his "Malefic Paradox Dragon" from Yami's card effects. Yami then smiles claiming his true target is "Stardust Dragon". Now Yusei gets his "Stardust Dragon" back on his field. Jaden then praises Yami for this, noting that Yami never wanted "Malefic Paradox Dragon" in the first place. By doing so, the effect "Malefic Paradox Dragon" is negated, thus returning the ATK of "Dark Magician" and "Elemental HERO Neos Knight" to their original amount. Yami then activates "Dark Magic Twin Burst", combining his two monsters' ATK together, raising the ATK of "Dark Magician" to 4500. He attacks and destroys "Malefic Paradox Dragon", resulting in Paradox losing 500 LP. Paradox then grins, claiming that these desperate moves change nothing. Yugi disagrees, mentioning to Paradox that he had two monsters and now he has none. Paradox mentioned that they only created the path for the Summoning of a powerful monster and activates "Malefic Paradigm Shift", which Summons "Malefic Truth Dragon" to his field when his "Malefic Paradox Dragon" is destroyed. This costs Paradox half of his LP to activate (Paradox: 1750 LP). Paradox then fuses with his new monster and everyone is amazed to see such a gigantic monster. Yugi then Sets 2 cards face down and ends his turn. By now, time has run out as Pegasus is about to arrive, but cannot land his helicopter due to Malefic World still being in play. Back in New Domino City, everybody is watching their dimension collapse but Crow knows that Yusei will be okay. Paradox then starts his turn. He plays "Malefic Selector" to remove "Malefic Parallel Gear" and "Malefic Cyber End Dragon" from play to add "Malefic Blue-Eyes White Dragon" and "Malefic Red-Eyes Black Dragon" to his hand. Paradox then sends both "Blue-Eyes White Dragon" and "Red-Eyes Black Dragon" from his Deck to the Graveyard to Special Summon "Malefic Blue-Eyes White Dragon" and "Malefic Red-Eyes Black Dragon". "Malefic Truth Dragon", "Malefic Red-Eyes Black Dragon" and "Malefic Blue-Eyes White Dragon" on Paradox's field. Yugi is shocked that "Red Eyes Black Dragon" and "Blue Eyes White Dragon" have become Malefic monsters as well. Paradox then attacks "Dark Magician Girl" with "Malefic Red-Eyes Black Dragon". At that point, he also mentions the effect of "Malefic Truth Dragon": if a Malefic monster destroys one monster, the other monsters are also destroyed. Jaden then activates Yugi's "De-Fusion", sending "Elemental HERO Neos Knight" back to the Extra Deck and Summoning his "Elemental HERO Neos" and Yusei's "Junk Gardna". Yusei then uses the effect of "Junk Gardna" to switch "Malefic Red-Eyes Black Dragon" to Defense Position, thus canceling its attack. Yugi praises both Jaden and Yusei for this impressive display of teamwork, but then Paradox attacks "Dark Magician" with "Malefic Blue Eyes White Dragon" and destroys it, costing Yugi, Yusei and Jaden 500 LP. He then activates the effect of "Malefic Truth Dragon", which would destroy all of Yami, Jaden and Yusei's monsters, but Yusei activates the effect of "Stardust Dragon" to negate the destruction effect of "Malefic Truth Dragon" and destroy it. However, Paradox activates the second effect of "Malefic Truth Dragon", which prevents its own destruction by removing his "Malefic Rainbow Dragon" from his Graveyard from play . He then attacks "Elemental Hero Neos" with "Malefic Truth Dragon" and thus activating its effect again, destroying "Dark Magician Girl" and "Junk Gardna". Also, for every monster destroyed, "Malefic Truth Dragon" inflicts 800 damage. Yami, Jaden and Yusei's LP are all reduced to 500 as all 3 of them are pushed back by the explosion. Paradox then activates "Malefic Divide", Special Summoning "Malefic Stardust Dragon" from the Graveyard. Banner realizes that the minute that the attack of "Malefic Stardust Dragon" hits, the trio will lose. Paradox then orders it to unleash its fury so that Duel Monsters will perish forever. Yusei falls to his knees, saying that everything is lost and the future is doomed. Jaden tells Yusei not to surrender reminding him that he's traveled through time to get this far. Yugi also tells Yusei that it's their beliefs in Duel Monsters that allowed the three of them to travel through time and meet, which means there must be a meaning behind it. Jaden reminds Yusei that whether their futures are right or not is up to them to decide before activating "The Flute of Summoning Kuriboh". The effect of "The Flute of Summoning Kuriboh" allows Yami to add "Kuriboh" to his hand. Yami then discards "Kuriboh" to reduce the Battle Damage to 0. Paradox ends his turn, but not before "Malefic Stardust Dragon" gets destroyed by the effect of "Malefic Divide" and the original "Stardust Dragon" gets Summoned back to Yusei's field due to its effect. Yami then tells Yusei that no matter which era he is in, his friends will always be supporting him. Yusei gets up, as Yami & Jaden tell Yusei to end the Duel while promising to aid him. Yusei activates "Stardust Mirage", Special Summoning all monsters that Paradox destroyed during this turn. This brings back "Dark Magician Girl", "Dark Magician", "Elemental Hero Neos" and "Junk Gardna". Paradox is shocked, as all the monsters previously destroyed in his turn are Special Summoned back to their field. Yusei then draws a card to start his turn, as Jaden then activates "Neos Spiral Force", doubling the ATK of "Stardust Dragon" to 5000. Yami then activates "Dark Spiral Force". This doubles the ATK of "Stardust Dragon" again to 10000. Yusei attacks "Malefic Truth Dragon" with "Stardust Dragon" and the combined efforts of "Dark Magician" and "Elemental Hero Neos", winning the Duel and restoring peace. Paradox is destroyed by the attack and is never to be seen again. Pegasus is finally able to land and arrive at the event. 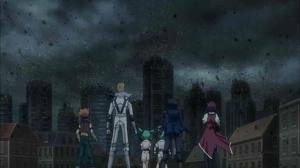 After the Duel, Yusei, Jaden, and Yami look down from the rooftop towards the event where Pegasus is among the crowd. Yusei believes that they will meet again and Yami say the three can duel each other when the time comes. He reminds Jaden and Yusei that as long as they believe in Duel Monsters, their bonds will always be linked. Jaden and Yusei then return to their respective timelines. Back at New Domino City, everybody comes running to Yusei as Yusei himself looks at the sky. Although he does not know whether the future Paradox spoke of is really true or not, he does know that they are the ones who decide the future. He promises Jaden and Yugi that he will protect his irreplaceable bonds and future. In the English dub, he also says that the true magic of Duel Monsters isn't in the cards, it's the bonds people forge because of it. Duel already in progress. Paradox controls no cards while Yusei controls "Junk Synchron" (1300/500) and "Junk Warrior" (2300/1300), both in Attack Position. Yusei tunes his Level 5 "Junk Warrior" with his Level 3 Tuner monster "Junk Synchron" to Synchro Summon the Level 8 "Stardust Dragon" (2500/2000) in Attack Position. At this point, Paradox uses a blank card to capture "Stardust Dragon" and corrupt it, making "Stardust Dragon" his card and leaving Yusei's card blank. The Duel, at this point, ends with no result as Paradox warps out of Yusei's era in time. The film featured a short one-on-three-Duel, with Paradox facing Yusei, Jaden and Yami Yugi. Paradox took every odd number of turns. Paradox had 4000 LP, while Yugi, Jaden and Yusei have a shared 4000 LP and one field. Paradox draws "Malefic Tune". Paradox's hand contains "Malefic Tune", "Malefic World", "Malefic Cyber End Dragon", "Malefic Claw Stream", "Malefic Selector" and "Malefic Paradigm Shift". Paradox activates the Field Spell Card "Malefic World". Now during each of Paradox's Draw Phases, he can add a random "Malefic" monster from his Deck to his hand instead of conducting a normal draw. If Paradox controls a face-up "Malefic" monster, non-"Malefic" monsters controlled by Paradox can't attack. Paradox then sends "Cyber End Dragon" from his Extra Deck to the Graveyard to Special Summon "Malefic Cyber End" (4000/2800) from his hand in Attack Position via its own effect. Paradox Sets a card. Yusei draws "Reincarnation of Hope" and subsequently activates it, discarding two cards to allow him to add a monster from his Deck to his hand during his second Standby Phase after this card's activation. He discards "Sonic Chick" and "Quillbolt Hedgehog". Yusei then Normal Summons "Junk Synchron" (1300/500) in Attack Position. As it was Normal Summoned, its effect activates, letting Yusei Special Summon a Level 2 or lower monster from his Graveyard in Defense Position with its effects negated. He Special Summons "Sonic Chick" (300/300). As he controls a Tuner monster, Yusei activates the effect of the "Quillbolt Hedgehog" (800/800) in his Graveyard, Special Summoning it in Attack Position. Yusei tunes his Level 1 "Sonic Chick" and Level 2 "Quillbolt Hedgehog" with his Level 3 Tuner monster "Junk Synchron" to Synchro Summon the Level 6 "Junk Gardna" (1400/2600) in Defense Position. As "Quillbolt Hedgehog" left the field, its effect removes it from play. Yusei Sets two cards. During his Draw Phase, Paradox activates the effect of "Malefic World" to add "Malefic Rainbow Dragon" from his Deck to his hand instead of conducting his normal draw. Paradox then sends "Rainbow Dragon" from his Deck to the Graveyard to Special Summon "Malefic Rainbow" (4000/0) from his hand in Attack Position via its own effect. "Malefic Rainbow" attacks "Junk Gardna", but Yusei activates the effect of "Junk Gardna" as an opponent's monster declared an attack, switching "Malefic Rainbow" to Defense Position. "Malefic Cyber End" attacks and destroys "Junk Gardna", with the effect of "Malefic Cyber End" inflicting piercing battle damage (Yusei, Jaden, Yugi: 4000 → 2600 LP). Since "Junk Gardna" was destroyed, its effect activates, switching a monster on the field to Defense Position. Yusei chooses "Malefic Cyber End". Yusei then activates his face-down "Miracle's Wake", letting him Special Summon a monster from his Graveyard that was destroyed by battle this turn. He Special Summons "Junk Gardna" (1400/2600) in Defense Position. Paradox Sets a card. Jaden draws "Polymerization" and subsequently activates it to fuse the "Elemental Hero Neos" in his hand with Yusei's "Junk Gardna" to Fusion Summon "Elemental Hero Neos Knight" (2500/1000) in Attack Position. The effect of "Neos Knight" increases its ATK equal to half the ATK of the Warrior-Type monster used that was not "Elemental Hero Neos" ("Neos Knight": 2500 → 3200 ATK). "Neos Knight" can attack twice per Battle Phase, so it attacks and destroys "Malefic Cyber End" and "Malefic Rainbow". As a "Malefic" monster he controls was destroyed, Paradox activates his face-down "Malefic Tune", drawing two cards. Jaden Sets four cards. During his Draw Phase, Paradox activates the effect of "Malefic World" to add "Malefic Stardust Dragon" from his Deck to his hand instead of conducting his normal draw. Paradox then sends "Stardust Dragon" from his Extra Deck to the Graveyard to Special Summon "Malefic Stardust" (2500/2000) from his hand in Attack Position via its own effect. Paradox Normal Summons "Malefic Parallel Gear" (0/0) in Attack Position. He then tunes his Level 8 "Malefic Stardust" with his Level 2 Tuner monster "Malefic Parallel Gear" to Synchro Summon the Level 10 "Malefic Paradox Dragon" (4000/4000) in Attack Position. Since "Malefic Paradox Dragon" was Synchro Summoned, its effect activates, letting Paradox Special Summon a Synchro Monster from his Graveyard, ignoring the Summoning conditions. He Special Summons "Stardust Dragon" (2500/2000). The effect of "Malefic Paradox Dragon" reduces the ATK of every monster controlled by his opponents by the ATK of all Synchro Monsters Paradox controls besides "Malefic Paradox Dragon" ("Neos Knight": 3200 → 700 ATK). "Malefic Paradox Dragon" attacks "Neos Knight", but Jaden activates his face-down "Hero Barrier", negating the attack as he controls an "Elemental Hero" monster. As he controls a "Malefic" Synchro Monster, Paradox activates his face-down "Malefic Claw Stream", destroying a monster his opponent controls. He destroys "Neos Knight". As an "Elemental Hero" monster he controls was destroyed by a card effect, Jaden activates his face-down "Elemental Mirage", returning the destroyed monsters to the field in the battle positions they were in. He Special Summons "Neos Knight" (2500 → 0/1000) in Attack Position. Paradox Sets two cards. Yugi draws "Ancient Rules". Since it has been two turns since Yusei activated "Reincarnation of Hope", its effect activates, allowing Yugi to add a monster from his Deck to his hand. He adds "Dark Magician". Yugi then activates "Ancient Rules", letting him Special Summon a Level 5 or higher Normal Monster from his hand. He Special Summons "Dark Magician" (2500 → 0/2000) in Attack Position. As he controls "Dark Magician", Yugi activates "Bond Between Teacher and Student", Special Summoning "Dark Magician Girl" (2000 → 0/1700) from his Deck in Defense Position. As he controls two or more Spellcaster-Type monsters, Yugi activates "Magic Gate of Miracles", changing an Attack Position his opponent controls to Defense Position and taking control of it. Thinking Yugi is going to target "Malefic Paradox Dragon", Paradox activates his face-down "Malefic Force", equipping it to "Malefic Paradox Dragon" and rendering it unaffected by the effects of his opponent's Spell Cards. However, Yugi uses the effect of "Magic Gate of Miracles" to instead take control of "Stardust Dragon". This action purifies "Stardust Dragon", making it Yusei's card again. Since Paradox no longer controls "Stardust Dragon", the ATK of his opponents' monsters return to their original values ("Neos Knight": 0 → 2500 ATK, "Dark Magician": 0 → 2500 ATK, "Dark Magician Girl": 0 → 2000 ATK). Yugi activates "Dark Magic Twin Burst", increasing the ATK of a "Dark Magician" he controls by the ATK of a "Dark Magician Girl" he controls ("Dark Magician": 2500 → 4500 ATK) until the End Phase. "Dark Magician" attacks and destroys "Malefic Paradox Dragon" (Paradox: 4000 → 3500 LP). Since "Malefic Paradox Dragon" was destroyed, Paradox activates his face-down "Malefic Paradigm Shift", paying half his LP (Paradox: 3500 → 1750 LP) to Special Summon "Malefic Truth Dragon" (5000/5000) from his Deck in Attack Position. Yugi Sets two cards. Paradox draws. He then activates "Malefic Selector", letting him remove from play two "Malefic" monsters in his Graveyard to add two "Malefic" monsters from his Deck to his hand. He removes "Malefic Parallel Gear" and "Malefic Cyber End" to add "Malefic Blue-Eyes White Dragon" and "Malefic Red-Eyes B. Dragon". Paradox sends "Blue-Eyes White Dragon" and "Red-Eyes B. Dragon" from his Deck to the Graveyard to Special Summon "Malefic Blue-Eyes" (3000/2500) and "Malefic Red-Eyes" (2400/2000) from his hand in Attack Position via their own effects. The effect of "Malefic Truth Dragon" will destroy all monsters his opponent controls and inflict 800 damage to his opponent for each destroyed monster when a "Malefic" monster destroyed a monster by battle. "Malefic Red-Eyes" attacks "Dark Magician Girl", but Jaden activates Yugi's face-down "De-Fusion", returning a Fusion Monster to the Extra Deck and Special Summoning its Fusion Materials. He returns "Neos Knight" to Special Summon "Neos" (2500/2000) and "Junk Gardna (1400/2600) from his Graveyard in Defense Position. As an opponent's monster declared an attack, Yusei activates the effect of "Junk Gardna" to switch "Malefic Red Eyes" to Defense Position. "Malefic Blue-Eyes" attacks and destroys "Dark Magician" (Yusei, Jaden, Yugi: 2600 → 2100 LP). The effect of "Malefic Truth Dragon" activates, but Yusei activates the effect of "Stardust Dragon", Tributing it to negate the effect of "Malefic Truth Dragon" and destroy it. As "Malefic Truth Dragon" would be destroyed, Paradox activates its effect, removing from play a "Malefic" monster in his Graveyard to prevent the destruction of "Malefic Truth Dragon". He removes "Malefic Rainbow". "Malefic Truth Dragon" attacks and destroys "Neos". The first effect of "Malefic Truth Dragon" activates, destroying "Dark Magician Girl" and "Junk Gardna" and inflicting 800 damage to Yugi, Jaden and Yusei for each monster destroyed this way (Yusei, Jaden, Yugi: 2100 → 500 LP). Paradox activates the Quick-Play Spell Card "Malefic Divide", letting him Special Summon a "Malefic" monsters from his Graveyard, ignoring its Summoning conditions, but it will be removed from play during the End Phase. He Special Summons "Malefic Stardust" (2500/2500). "Malefic Stardust" attacks directly, but Jaden activates his face-down "The Flute of Summoning Kuriboh", letting him add a "Kuriboh" or "Winged Kuriboh" from his Deck to his hand. Yugi adds "Kuriboh" and then activates its effect, discarding it to reduce the battle damage to 0. During the End Phase, "Malefic Stardust" is removed from play due to the last effect of "Malefic Divide". At the same time, "Stardust Dragon" revives itself in Attack Position through its second effect. [Notes 1] As he controls a "Stardust Dragon", Yusei activates his face-down "Stardust Mirage", returning all monsters destroyed this turn to the field in the same battle positions they were in. "Dark Magician" returns in Attack Position (2500/2100), while "Dark Magician Girl (2000/1700), "Neos" (2500/2000) and "Junk Gardna" (1400/2600) return in Defense Position. Jaden activates his face-down "Neos Spiral Force", doubling the ATK of a monster he controls, but "Neos" may not attack this turn ("Stardust Dragon": 2500 → 5000 ATK). Yugi activates his face-down "Dark Spiral Force", doubling the ATK of a monster he controls, but "Dark Magician" may not attack this turn ("Stardust Dragon": 5000 → 10000 ATK). "Stardust Dragon" attacks and destroys "Malefic Truth Dragon" (Paradox: 1750 → 0 LP). The following cards were used in the film. Italics are used to denote cards whose first appearance was in the film. The film was first announced in July 2009. Previews for the film started on July 1, 2009. They appeared at the beginning of episodes of Yu-Gi-Oh! 5D's in the form of short Yu-Gi-Oh! anime tenth anniversary tributes, starting with episode 65. The November issue of V Jump confirmed that the animation would be a 3D film released on January 23, 2010. A trailer for the film was shown in October at the Jump Fest Anime Tour 2009. On October 19, 2009 an official website provided a list of theaters where the film would be shown. Starting November 18, 2009 with episode 85, the previews at the beginning of episodes showed 9 face-down cards. Each week a new one was turned over. The cards in order of appearance were. "Malefic Blue-Eyes White Dragon", "Malefic Red-Eyes Black Dragon", "Malefic Stardust Dragon", "Malefic Cyber End Dragon", "Malefic Rainbow Dragon", "Elemental HERO Neos Knight", "Junk Gardna", "Malefic Parallel Gear" and "Malefic Paradox Dragon". Sakiyomi JumBANG! featured the film in their 35th episode, on November 27, with guests Yuya Miyashita and Takanori Hoshino, Yusei and Jack's voice actors. and their 42nd episode on January 22, 2010. In this episode, the Sakiyomi JumBANG! crew mentioned that they would be appearing in the film as MCs. A trailer is available on the film's official website. A thirty minute preview of the film was shown on January 17, 2010. Kazuki Takahashi and the V Jump cosplayers, Kaiser Umiuma and Shironosu attended this event. In March 2010, during 4Kids Entertainment's quarterly conference, Alfred Kahn announced that they were working on dubbing the film in English. A trailer of the English dub of the film was shown at San Diego Comic Con 2010. Several scenes from the film were shown at the Yu-Gi-Oh! World Championship 2010 in Long Beach. These scenes were not dubbed in English, but were localized subtitles of the Japanese version. At an encore screening on February 20, 2011, details on the production of the then-upcoming Yu-Gi-Oh! ZEXAL series was announced. The second 2011 issue of Weekly Shonen Jump included details of the screening and a competition allowing one hundred and ten readers to win passes to see it. The film's main theme music is "makemagic" by jealkb. The ending credits for the English version is a combination of the "Yu-Gi-Oh! Theme", "Get Your Game On!" and "Hyper Drive", the opening and ending themes for the dubbed versions of Yu-Gi-Oh!, Yu-Gi-Oh! GX and Yu-Gi-Oh! 5D's, respectively. The following background music is played during the Japanese version of the film. "Jose" Intro to Yusei's dream and during the Riding Duel, up to "Stardust Dragon" being stolen. "Placido's Fusion" Paradox's fourth turn and the Summoning of "Malefic Truth Dragon"
"Bonds of the Three" The Summoning of "Kuriboh"
The film was released on January 23, 2010 in Japan. In the United States, it was shown with a limited run on February 26 and 27, 2011 and again on March 5 and 6, 2011. Some theaters in the North East that showed the film throughout the week February 21 to 25, 2011 due to the closing of schools for vacation. The film had a second release in Japanese theaters that started on February 26, 2011. to coincide with the release in the United States. This re-release in Japan has 10 minutes of additional animation in 2D. The 10 minutes of additional footage in the North American release featured 10 minutes of flashback footages on the protagonists. 4Kids Entertainment planned to have a television premiere of the film in English, sometime after showing it in theaters. In the United Kingdom the film was shown on May 14, 2011 in theaters. 4Kids Entertainment planned to release the film on DVD in English, sometime after showing it in theaters. Its official home video release date was July 15, 2014. In the United Kingdom the film was available on DVD and Blu-ray from Manga Entertainment and originally slated to be released on May 30, 2011, but was released on July 25, 2011. In addition to the dubbed version, it includes the original Japanese version of the film, subtitled and completely unedited. "Malefic Red-Eyes B. Dragon" promotional cards were distributed at cinemas to people attending the film in Japan and America. It was Ultra Rare and it was included inside a sample for the Yu-Gi-Oh! 5D's manga. Malefic Red-Eyes B. Dragon is also included as a Super Rare in the DVD version. The Yu-Gi-Oh! 10th Anniversary Animation Book was released on January 21, 2010 It contains information on scenes from the film, a quick review of the three series, character profiles, Duels and interviews with the staff of the film. The film debuted at #6 in the Japanese Box Office chart, earning over a million US dollars in 24 theaters in its first week. It had however dropped from the charts by the next week. The film holds a 67% rating on Rotten Tomatoes based on 450 ratings. Critics generally said that the film would only be of interest to people who are already fans of the series. Phelim O'Neill from The Guardian commented that the film is strictly for kids and the target audience might get a kick out of it, but for older people it is just "a shouty, tacky advert for things [they'll] never buy". Jamie Russell from Total Film said "the migraine-inducing visuals and game-heavy dialogue will leave most non-fans clawing their eyes out". The original "Rainbow Dragon" is seen on Paradox's Duel Disk. Several times during the Duel, fewer cards are seen in someone's hand than there should be. When Yusei revives "Junk Gardna" with "Miracle's Wake", a face-down card is seen on both sides of it when there should have only been one. When Jaden is about to attack "Malefic Rainbow Dragon", the original "Rainbow Dragon" is seen on Paradox's Duel Disk instead of its "Malefic" version. 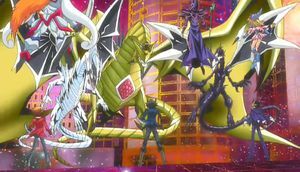 When Paradox Synchro Summoned "Malefic Paradox Dragon" and it appeared on the field, "Elemental Hero Neos Knight" is not on the field but its card is seen on Jaden's Duel Disk after "Malefic Paradox Dragon" is Summoned. When Yusei revives all of his team's monsters with "Stardust Mirage", the DEF of "Junk Gardna" is shown as 2500 instead of 2600.
Pegasus is shown with the Millennium Eye, despite the movie taking place after he lost it at Duelist Kingdom. In the dub, when Yusei activates "Stardust Mirage" the underside of Jaden's face-down is also "Stardust Mirage" instead of "Neos Spiral Force". In the dub, when Yugi uses the effect of "Kuriboh" to block the attack of "Malefic Stardust Dragon", he calls it "Stardust Dragon" instead of "Malefic Stardust Dragon". Yugi seems to indicate to meet Jaden for the first time here, which contradicts the last episodes of Yu-Gi-Oh! GX, as Yugi shows to have met Jaden for the first time there as well, and thus Yugi should remember Jaden through one of these events. ↑ In the TCG/OCG, "Stardust Dragon" could not have been Special Summoned to Yusei's field, as Paradox was the owner of the card as that term is defined in gameplay. In addition, since it was never properly Synchro Summoned, it would be ineligible for a Special Summon in the first place. ↑ This card is shown in the ending credits, hinting that it was the card Yusei drew on his final turn. ↑ The music that was played in Yu-Gi-Oh! GX episode 65: "No Pain, No Game" when Ryo Marufuji (Zane Truesdale) defeats Inukai (Mad Dog). ↑ Yu-Gi-Oh! 5D's episode 146: "The Last Human, Z-ONE"
↑ Yu-Gi-Oh! 5D's episode 65: "A New Threat, Part 1"
↑ Yu-Gi-Oh! 5D's episode 85: "Mother Knows Best"
↑ Yu-Gi-Oh! 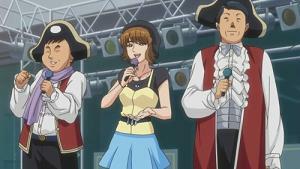 5D's episode 86: "Duelist For Hire"
↑ Yu-Gi-Oh! 5D's episode 87: "Showdown at Sundown, Part 1"
↑ Yu-Gi-Oh! 5D's episode 88: "Showdown at Sundown, Part 2"
↑ Yu-Gi-Oh! 5D's episode 89: "The Race to Escape, Part 1"
↑ Yu-Gi-Oh! 5D's episode 90: "The Race to Escape, Part 2"
↑ Yu-Gi-Oh! 5D's episode 91: "Clash at Crash Town, Part 1"
↑ Yu-Gi-Oh! 5D's episode 92: "Clash at Crash Town, Part 2"
Yu-Gi-Oh! 3D: Bonds Beyond Time.